Pres. Obama presented two legendary songwriters with America's highest prize for popular music. 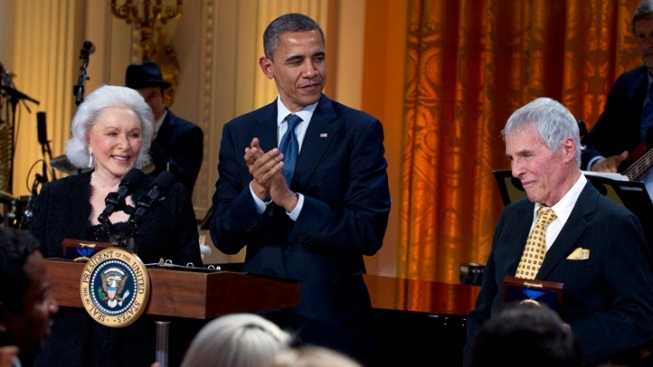 President Obama honored two songwriting greats on Wednesday evening. President Barack Obama honored Burt Bacharach and Hal David on Wednesday night as "two kings of songwriting," presenting them the nation's highest prize for popular music at the White House. The songwriting duo received the Library of Congress Gershwin Prize for Popular Song during a tribute concert in the East Room, featuring Stevie Wonder, Sheryl Crow, Lyle Lovett and others. Wonder sang their tunes, "Make It Easy on Yourself" and "Alfie," wowing the crowd on his harmonica. Bacharach, 83, thanked Obama, saying the award for his life's work topped even the Oscars and Grammys he won for individual projects. David, 90, could not attend because he is recovering from a stroke. His wife, Eunice David, accepted on his behalf. Bacharach and David have written many unforgettable tunes — "Raindrops Keep Fallin' On My Head," ''Close to You" and "That's What Friends Are For" all come from their songbook. They produced dozens of top 40 hits, churning out hit music for movies, television and a variety of recordings artists in the 1960s and beyond. More than 55 years after their first songs hit the airwaves, Obama said "these guys have still got it." He noted Bacharach appeared in recent years on "American Idol" and "Dancing With the Stars," and their music is still being recorded by such artists as Alicia Keys and John Legend. "Above all, they stayed true to themselves," Obama said. "And with an unmistakable authenticity, they captured the emotions of our daily lives — the good times, the bad times, and everything in between." The Library of Congress, which houses the world's largest collection of sheet music and some of the earliest sound recordings, awards its Gershwin Prize as a lifetime achievement award to honor the legacy of the songwriting team of George and Ira Gershwin. Bacharach and David truly reflected the Gershwins as a combination of composer and lyricist and have produced one of the world's "most recognizable and richest multigenerational playlists," said Librarian of Congress James Billington. "This is music that has filtered through and survived not only their lifetimes, but people will go on discovering their tunes that aren't as recognizable," Billington said. Past recipients of the Gershwin Prize have included Wonder, Paul Simon and Paul McCartney. This is the first time it has gone to a songwriting duo. Many lyrics and tunes from Bacharach and David are timeless, from "Do You Know the Way to San Jose" and "I Say A Little Prayer" to "What The World Needs Now Is Love." They produced dozens of top 10 hits that continue to resonate in pop culture. Their music was recorded by legendary singers including The Beatles, Barbra Streisand, Frank Sinatra, Neil Diamond and their longtime partner Dionne Warwick. At the White House, stars including Diana Krall, Mike Myers and Lyle Lovett were to perform in their honor. The private concert will be broadcast May 21 on PBS for the series "In Performance at the White House." The library also hosted a concert Tuesday night featuring Warwick. Bacharach told The Associated Press he wanted to hear the president sing a few lines "because the guy can really sing." "I heard him on YouTube sing 'Walk On By,' and it just blew me away," Bacharach said. In the YouTube video, a younger Obama told a crowd that when he was 15 or 16, he would slip in a Warwick cassette "to show you were real smooth," before he sang part of "Walk On By." The White House ousted reporters from Wednesday's concert before there was any chance to hear Obama sing again. Bacharach said in an interview that he was influenced by a lifetime of experiences. He learned to play piano to please his mother but thought he'd be a football player. The sounds of classical music and tunes from Brazil stuck with him. He also would sneak into Manhattan nightclubs with a fake ID to hear Dizzy Gillespie, Thelonious Monk and Charlie Parker play. Early in his career, Bacharach toured as the accompanist and conductor for Marlene Dietrich, and soon after he as writing R&B hits — two opposites in his life, he said. David had been a newspaperman in New York before taking his word-smithing to music, Obama said. "Soon, the football player and the journalist started writing songs, and they struck gold," the president said. Bacharach said he was sad to see David miss the honor. "It's a big one for him to miss," he said. "I know this is as good as it gets." Most of Bacharach's writing with David was defined by capturing the sensual side of music. David would usually write the lyrics first and then pass them to Bacharach to set to music because they had to help tell a story, often for film or stage. They produced film scores for "Alfie," ''A House is not a Home" and "Butch Cassidy and the Sundance Kid," among others and the musical "Promises, Promises," which won a Grammy and was revived on Broadway in 2010. Often they were writing songs for the female voice. "They're love songs ... a lot of them deal with the heart and the lonely heart or heartbreak and taping into the romance of music," Bacharach said. "I think you're a sponge in your life. You go through your life and whatever you're exposed to you take in, it gets into your system."